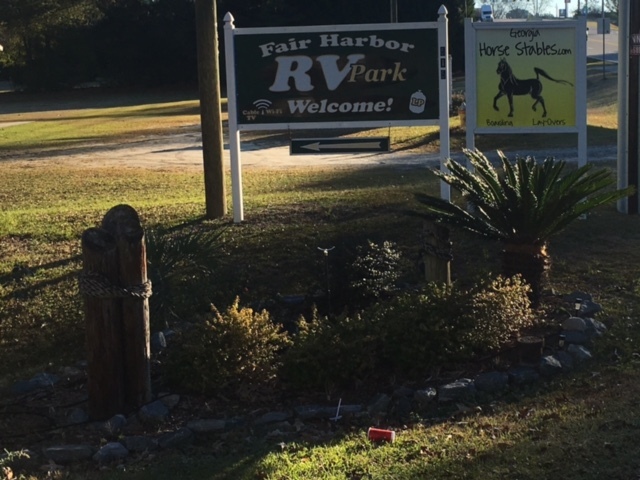 Perry Ga – Let's Go RVing! What a great day. We got an early start again but this time it was to attend church on the fairgrounds. It was such a great service. The FMCA Chaplain, George Archer began the service with congregational singing with his wife playing the keyboard. They both did a grand job. Following that The Singing Auctioneer sang two beautiful songs and then Mr. Archer gave the sermon about what our purpose in life is. The scripture was from Ephesians 3. Two things he said stuck in my mind. One, “Keep me in Your Will Jesus so I won’t be in Your way” and two, “You are the glove that Jesus fits into.” What a way to end a great week. Jerry and I had some shopping to do today so off we went to the exhibits. He bought a TPMS from TechnoRV. He had looked at other vendors but decided on buying from Eric mainly because of the support we have received on the Wi-Fi booster. When Jerry was at the Almost Heaven seminar they had thrown out a small rubber chicken and Jerry caught it. If he wore it all week he could get a free micro fiber drying towel. Well, he got some strange glances but he wore it the entire time so we went to pick that up. I bought four of the cleaning cloths and am hoping to use them tomorrow. Having the windows open with all of the pollen around means a cleaning job ahead. I wanted a couple of things from Tupperware so we headed over there to get those. While in that exhibition hall we relaxed in the massage chairs selling for about $3000.00. It would be nice if we could afford one because they were great! While walking around Jerry saw a flag pole that he liked. He has been looking for one for a while but had not found one he liked until this one but we decided to pass on it. We went back to the coach to get a quick lunch and then headed back to the fairgrounds. After having attended the session on the Velcro we wanted to get some of that. At $7 we thought we had a bargain. I asked Jerry if he wanted the flag pole for his birthday gift. I’ve already gotten him a little something but was planning to get something else and this fit the bill. He said he thought that would be perfect so we went back over to the hall and bought that. We were planning to attend the Eastern Region meeting for FMCA at 3:00 and we had plenty of time so we went back over to look at the new motor homes. We went in Entegras, American Tradition and Tiffin. While I saw floor plans that I liked maybe a little better than ours they were all diesel and unless I change my mind or win the lottery (which will be difficult having never bought a ticket) I will stick with our gas engine. The meeting for the Eastern Region was interesting and we learned more about FMCA. They announced a rally that is going to be held in West Virginia in October the same week-end State has a home game against Notre Dame. What do you think our changes of attending the rally are? After the rally a guy from the Carolina Pelicans came over and told us about his group. Although it is basically a South Carolina group they do have some members from North Carolina. They were extremely friendly and even invited us over to a social at 5:00. We came by to the RV and put on some warmer clothes (it’s a bit chilly in Georgia tonight – down to 39), grabbed a couple of chairs and something to drink and headed back out to the fairgrounds to the social. I think my car could drive that route automatically! What a nice group of people. We met many new friendly people, had a good meal and joined the group! It only cost $12. They will be sending us additional information. Some of the folks were leaving Perry and going to Hilton Head for the week. The next rally will be at St. James Island in Charleston, SC the first week-end in June. I asked Jerry if he wanted to go and he said it didn’t matter. Actually I think all of the sites are taken so there won’t be any room but I think it would be fun to go. I have always heard that if you didn’t like the weather in North Carolina to just wait because it would change. Well, we found out that was true in Louisiana and guess what, it’s true in Georgia as well. Last week when we arrived it was HOT. We were trying to get set up and the air conditioner was not working and we were dying. Today was breezy and cool, cooler, and cold. I changed clothes three times dressing a little warmer each time. In fact we came back to the campground after the Carolina Pelicans social and got some coffee and then you’re right – we headed back to the fairgrounds to hear Pamela G and Jackie B., the Sweethearts of Mountain View, Arkansas. They were absolutely fantastic singing different genres of music. At one point we even got up and danced to one of their songs. They ended with a set of gospel songs and then the last song was a tribute to the different branches of service with a finale of God Bless America. What a way to end a convention. Church in the morning and then these ladies at night. It has been a great convention and as “first timers” we are surely hoping we’ll be able to attend more. Next year it will be in Indianapolis and then in 2018 back in Perry.